General Hospital (GH) spoilers tease that the details of Oscar’s (Garren Stitt) background will slowly trickle out. We’ve all been waiting to learn more about this secretive kid, but he’s stayed mostly tight-lipped. It’s clear that there are some big shockers ahead on the ABC soap. One major revelation will be the identity of Oscar’s dad. When Oscar first came on, clues were dropping left and right. It seemed like the show was going to make Dante (Dominic Zamprogna) the father, but those hints suddenly disappeared. There’s a good chance that was the original plan, but GH might’ve decided to go in a more exciting direction. The General Hospital writers have admitted that they sometimes shift gears while a story’s in play. It’s not unusual if a better idea comes along. Steve Burton’s (ex-Jason) return may have been a huge part of the potential changes. 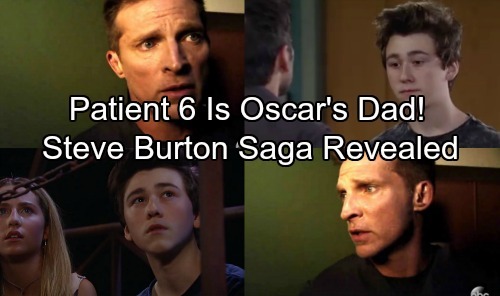 Could Patient Six be Oscar’s father?! 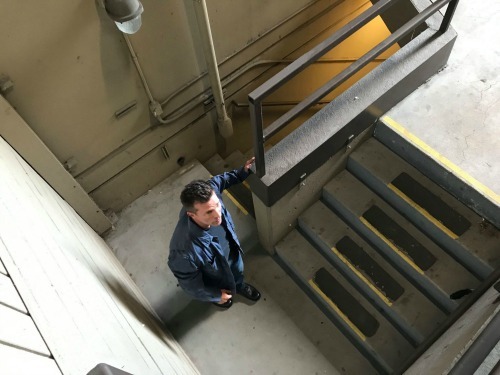 General Hospital spoilers say Steve Burton’s comeback will tie in with what’s ahead for Oscar. If Burton’s character is Oscar’s dad, then that info makes sense. How else are they going to fit these storylines together? The father route is the most logical here. Of course, we have to remember the Jason (Billy Miller) twin situation. It looks like Patient Six will ultimately be revealed as either Jason or Drew. Since everyone keeps talking about how different Jason is these days, it seems likely that Burton’s version is the real deal. Carly (Laura Wright) recently mentioned her concerns about Sonny’s (Maurice Benard) mob ties. She suggested that Oscar’s mother might not like it if she knew what Sonny did for a living. General Hospital may be foreshadowing some drama once Burton’s character arrives. After all, current Jason is stepping away from Sonny’s world. That leaves the door open for Burton’s character to pitch in. This could stir up serious issues for Oscar. His mom may want to leave town if she feels his father poses a threat. Naturally, Josslyn (Eden McCoy) would be devastated by the thought of Oscar moving away. Plus, Oscar could become a little rebellious. He would want to confront his dad and eventually get to know him a bit better. Plenty of possibilities that could come from all this. Bottom line, Oscar is missing a father and Patient Six is headed to Port Charles. Put those together and it’s a fantastic layer in the Jason saga. We’ll give you updates as other news comes in. Stick with ABC’s GH and don’t forget to check CDL often for the latest General Hospital spoilers, updates and news. Will TPTB At GH Make Patient 6 Oscar’s Dad?